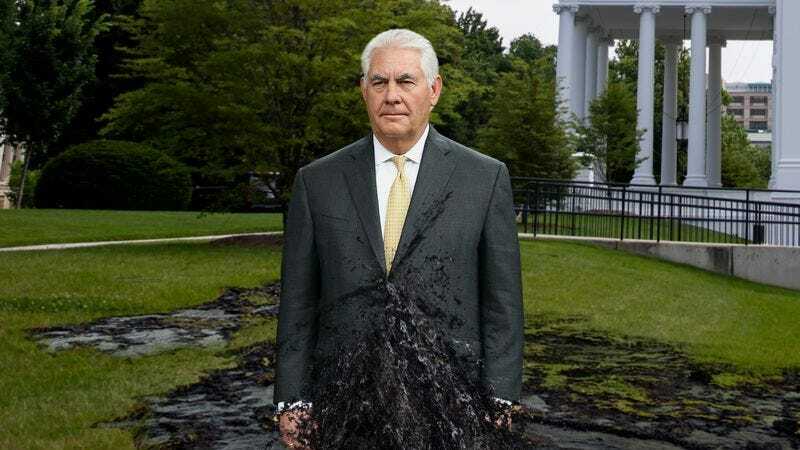 WASHINGTON—In what is being called one of the greatest disasters of its kind, millions of gallons of oil began spilling into Washington on Friday following a rupture in Secretary of State Rex Tillerson. “There’s been a failure in his containment system, and now oil is gushing out of his left shoulder at a rate of 5,000 barrels per day,” said chief rig operator Kevin Sullivan, adding that having the senior cabinet official in such a heavily inhabited area was an environmental catastrophe waiting to happen, as the 65-year-old former ExxonMobil CEO should have been decommissioned years ago due to his age and deterioration. “We first tried putting a containment dome over him, but after that failed, we began airlifting affected citizens out of the greater Washington area and then removing the oil via controlled burns, while using remotely operated vehicles to plug Tillerson with cement. Cleanup crews are working around the clock to alleviate the damage, but we project the losses from this disaster to be in the billions, not to mention the grave impact it will have on the ecology of the region.” At press time, the disaster relief team had successfully managed to divert some of the flow to EPA administrator Scott Pruitt.